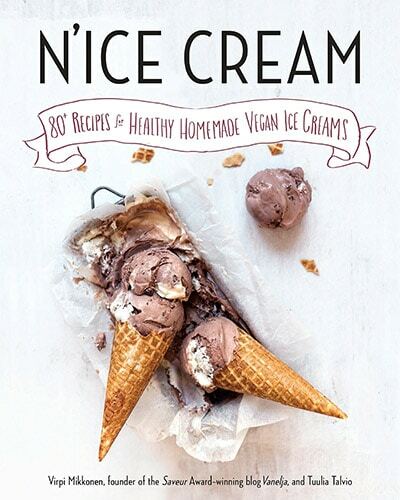 N’ice Cream features recipes that can be made with or without an ice cream maker, and include foolproof instant ice creams that can be savored right away. As Tuulia and Virpi say, people deserve to eat goodies without feeling crappy afterward, and now they can; all the recipes are dairy-free, gluten-free, and refined-sugar-free, and many are nut-free and raw as well. These delicious recipes include creamy ice creams, soft serves, and milkshakes; fresh sorbets and popsicles; party fare like ice cream cakes, sauces, and more. Enjoy light, summery treats like Coconut Water Coolers and Apple Avocado Mint Popsicles, or relish more decadent fare like the Dreamy Chocolate Sundae and Mint Chocolate Ice Cream Sandwiches. The book itself is designed with mouth-watering photographs. Perfect for those who want to devour summer treats without guilt, N’ice Cream is about to make your summer a whole lot more delicious. Virpi Mikkonen is a food blogger, food writer, recipe designer, and certified health coach (from Institute for Integrative Nutrition, New York) with a background in journalism. Virpi’s blog, Vanelja, won Best Designed Blog at the Saveur Awards in 2015, and has been featured in Honest Cooking, HuffingtonPost, Yahoo Food, and elsewhere. Her favorite recipe in N’ice Cream is the Salty Caramel Popcorn Ice cream. Tuulia Talvio is a food blogger and certified yoga instructor. Her blog, Tuulia, has been featured in Brit +Co, Camille Styles, Yahoo Food, and Feedfeed. Her favorite ice cream in N’ice Cream is the Coconut Sundae.